Download the handout for Challenge 01. NEW RESPONSE #1 from Zoltan Raffai's students. ​NEW RESPONSE #2 from Zoltan Raffai's students. Shelby, Tasha, & Tommy's solution. Thoughts on Ermer primes from Chris. Daniel's solution divides the counting into two cases, but John's solution does not. Why does Daniel need to to this? Why can John avoid it? 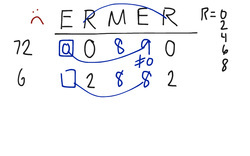 One way to count the even Ermer numbers is to count all of the Ermer numbers and subtract away the odd Ermer numbers. Explore this approach and compare it to the video responses above. Chris's video mentions two prime Ermer numbers. How might we go about finding all of the Ermer primes in a relatively efficient way?